IFA was founded 18 years ago with a mission to provide the best investor education available. Understanding that investment knowledge is one of five dimensions of an investor's risk capacity, we are committed to providing empirical insight into how financial markets work. This knowledge contributes to an investor's higher risk capacity, higher risk exposure and higher expected returns. We estimate that the average investment advisor allocates their average clients to about 50% stocks and 50% bonds portfolios, while at IFA, our average client is invested in about 70% stock and 30% bonds. As Benjamin Franklin said, an investment in knowledge pays the best dividends. Our newest educational tool comes in the form of an instrument that allows investors to visualize how markets work. Almost 3 years in the making, The Random Walker® (TRW) is a 7.5 inch by 4.5 inch desktop version of our 8 foot by 4 foot probability machine, “Sir Francis”, that sits proudly in the lobby our headquarters in Irvine, CA. The United States Patent Office has issued a design patent for The Random Walker® under the title of a “Visual Aid that Demonstrates a Random Walk and Generates a Bell Curve Distribution" (US Patent No. D784449). The Random Walker® demonstrates the similarities between the bell curve, cascading beads, and the stock market. As you rotate TRW on its axis, you set into motion a flow of almost 3,000 steel beads that bounce with equal probability to the left or right through 12 rows of pegs. The instrument must be sitting on a level surface to have an equal chance of going left or right. The pegs are arranged in a quincunx pattern. As the beads randomly land in one of the 28 the bins, they approximate the bell curve, as shown by the yellow line on the front of TRW. The most likely bins for the beads to land in are those toward the middle. 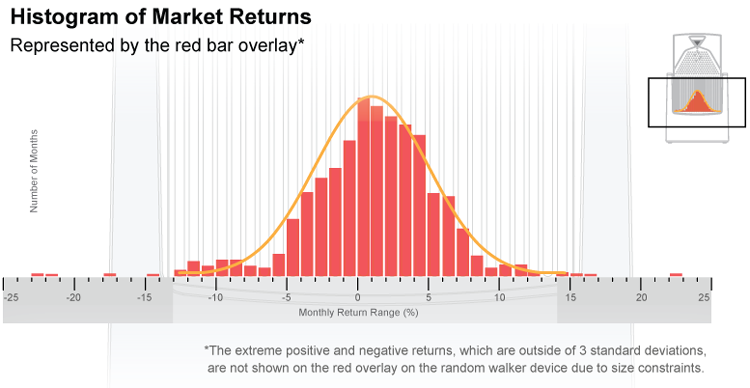 A similar distribution is found in nearly 600 monthly returns of a global stock market index, as shown in the red bars on the back. The Random Walker® allows you to visualize the order embedded in the chaos of randomly occurring events, such as cascading beads bouncing off pegs and the randomly occurring news that creates the random walk of stock market prices on Wall Street. Similar devices that just generate a bell curve have been called a Quincunx, a Galton Board, a Random Mechanical Cascade, or a bean machine. Please play the video below to see TRW in action. The red bars silk screened on the back of the instrument represent 592 monthly returns of IFA Index Portfolio 100 for the 50 year period ending in 2015. The center of the bell curve represents a return of about 1% per month with one standard deviation from the mean being about 5%. Eight monthly returns fell outside of the three standard deviations from the mean shown in the 28 bins of the instrument. As you can see below, the 50 years of monthly returns approximate the bell shape curve. There were four monthly returns on each side of the bell curve that were beyond the three standard deviations shown in the 28 bins. The extreme monthly loss to the left side of the curve was a -22.59%, which occurred in October 2008, and the extreme positive return on the right side of the bell curve was 22.42%, which occurred in January 1975. Please note the similarity in the distance from the mean for both of these extreme events. From the fair price, each of these outcomes had an equally low chance of occurrence, which was about one in 600. The expected outcome and ranges of outcomes for the future are estimated from the mean and standard deviation of a statistically sufficient large sample of carefully measured outcomes. Given 600 monthly returns, this distribution could be a reasonable model of what we might expect in the future from free and diversified global stock exchanges like we have had in the past. There are currently more than 40 stock exchanges around the world. There are about 10 million traders with sufficient information to set fair prices and they trade about 10 Billion shares a day. This distribution of monthly returns provides useful information for investors. TRW is modelled after the Galton Box, named after Sir Francis Galton (1822-1911). Galton wanted to demonstrate the central limit theorem and show that the normal distribution (bell-shaped curve) is approximately similar to the binomial distribution. The original Galton Board was built in 1893 and is on display in the Galton Collection, University College London (see image on the left). In the top left corner it states, "Instrument to illustrate the principle of the Law of Error or Dispersion, by Francis Galton FRS. 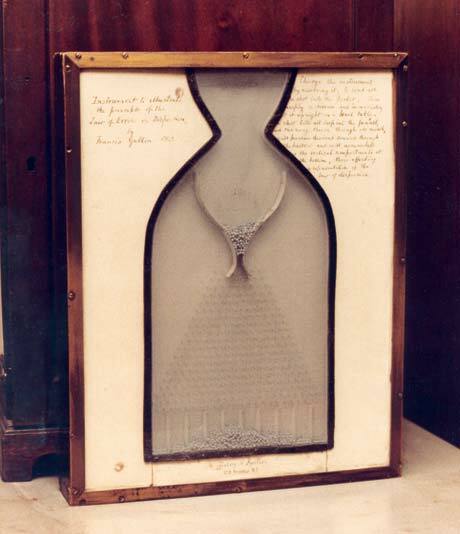 The photo of the Galton Box appears in The History of Statistics by Stephen M. Stigler. For an interesting article on the history of a quincunx instrument see here. If someone wants to better understand and experience the process of a random walk right on their desk, The Random Walker® is the perfect instrument. Wikipedia states that "a random walk is a mathematical object, known as a stochastic or random process, that describes a path that consists of a succession of random steps on some mathematical space such as the integers. For example, the path traced by a molecule as it travels in a liquid or a gas, the search path of a foraging animal, the price of a fluctuating stock and the financial status of a gambler can all be approximated by random walk models, even though they may not be truly random in reality. As illustrated by those examples, random walks have applications to many scientific fields including ecology, psychology, computer science, physics, chemistry, biology as well as economics. Random walks explain the observed behaviors of many processes in these fields, and thus serve as a fundamental model for the recorded stochastic activity. The term random walk was first introduced by Karl Pearson in 1905." Also according to Wikipedia, "The random walk hypothesis is a financial theory stating that stock market prices evolve according to a random walk and thus cannot be predicted. It is consistent with the efficient-market hypothesis. The concept can be traced to French broker Jules Regnault who published Calcul des Chances et Philosophie de la Bourse in 1863, and then to French mathematician Louis Bachelier whose Ph.D. dissertation titled "The Theory of Speculation" (1900) included some remarkable insights and commentary. The same ideas were later developed by MIT Sloan School of Management professor Paul Cootner in his 1964 book The Random Character of Stock Market Prices. The term was popularized by the 1973 book, A Random Walk Down Wall Street, by Burton Malkiel, a Professor of Economics at Princeton University, and was used earlier in Eugene Fama's 1965 article "Random Walks In Stock Market Prices", which was a less technical version of his Ph.D. thesis. The theory that stock prices move randomly was earlier proposed by Maurice Kendall in his 1953 paper, The Analysis of Economic Time Series, Part 1: Prices." TRW also demonstrates the link between a social science and a physical science, where numerous outcomes in both processes result in approximately a bell-shaped curve. The study of stock markets, known as financial economics, is classified as a social science where human buyers and sellers seek a fair price from which the buyer expects a fair return. That fair return can be estimated from the center of the resulting bell curve of a very large sample of historical monthly returns. From a fair price there is an equal chance that the next price will result in a return higher or lower than the fair return. The Random Walker® also represents a display of a physical science, where gravity propels steel beads through an interleaved or quincunx pattern of pegs in a way that there is an equal probability that the bead will bounce to the left or right when it bounces off every peg. This assumes that TRW is sitting on a flat surface. The Central Limit Theorem tell us that as the number of beads, which simulate independent random variables, approaches infinity, the distribution approaches the bell-shaped curve. In another interesting application, if you overlay Pascal's triangle over the pegs in TRW, it shows us the number of different paths that can be taken through the pegs to arrive in each bin. The animated image of Pascal's Triangle shows how the math works. Because prices have been shown to follow a random walk where past price movements give us no reliable information about future price movements, there is the potential for a wide distribution of outcomes based on the risk of the investment and the type, frequency, and magnitude of future news and events. As this process is repeated day in and day out, a pattern starts to emerge that allows investors to describe what is “expected” and to quantify the odds in terms of deviation around what is expected, both positive and negative. What's important for investors to understand is that these outcomes are expected to happen based on the risk and return characteristics of a globally diversified portfolio and chance events that impact the price in the future. The more you understand this concept, the more grounded you will feel when we experience outcomes that are different than expected in the future. It doesn’t mean that markets are broken or that its indicative of anything about the future prospects for investors. It is just another outcome that we expect to happen based on the approximate probability distribution of a large sample of past outcomes. As you obtain a better understanding your capacity for risk based on the Five Dimensions of Risk Capacity, you will invest in a particular portfolio that represents a distribution of potential outcomes that are appropriate for your risk capacity. The higher the risk, the higher the expected return, but also the wider the distribution of potential outcomes and vice versa. This is why risk capacity and the matching risk exposure is probably the most crucial metric to understand for an investor. The chart below shows the bell curve of monthly returns for many different portfolios and many different periods. Index Fund Advisors has always been committed to providing high quality investor education, almost all of which is available on the internet. Anyone can peruse our website and find a wealth of information covering many different topics. The Random Walker® is the next generation of our education. Every time you flip it over, it gives investors a reminder of how markets work and the futility of trying to time any aspect of investing. More information can be found at TheRandomWalker.com and The Random Walker® is now available on amazon.com. The Random Walk Theory essentially states that there are no discernible patterns in stock market prices. The logic and reasoning goes like this. Many measurements seem random, such as the heights of humans, the length of leaves, the roll of 5 dice, and the change of stock market prices. But when academics, statisticians and mathematicians view the world, they see patterns that others do not notice. In the field of finance, standard deviation represents the risk associated with a security (stocks or bonds), or the risk of a portfolio of securities (including actively managed mutual funds, index mutual funds, or ETFs). Why Does This Machine Simulate Monthly Market Returns?